Great quality, fast shipping and great customer service! Users who place orders with me may receive a one-time invitation to stay updated when I list new products in my store. 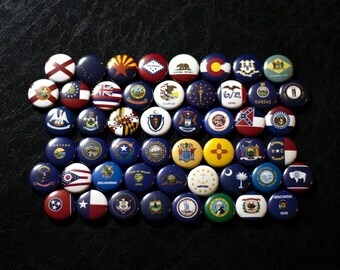 Do you have flag buttons for a certain city/state/country? Please note, I don't do rush orders, so I can't create new items for specific events. Will my package arrive by a certain date? The time it takes for an item to be ready to ship varies by item and I don't do rush orders, so plan ahead. Paintings typically ship within 1-3 business days, but buttons are made-to-order and can take 3-5 business days. The larger the order, the longer it will take to make! Do you offer any discounts for bulk quantities? Yes! If you need 100 or more buttons, I offer a 10% discount for quantities of that size. (Please contact me so we can work out the details.) If you need 50 or more buttons, you qualify for free standard shipping! Please Note: Free shipping does not apply to Priority Mail or Priority Mail Express. How do you handle packages that the post office is unable to deliver? For items that I normally carry in my store that have been returned to me as undeliverable, I will refund the price of the item MINUS the cost of shipping. However, no refunds will be offered on custom orders. It is up to the buyer to make sure their address is correct on the package, that they get expedited shipping if they need an item urgently, and that insurance is purchased in case the post office loses their package. Once a package has left my possession, delivery issues are between the buyer and the post office. I haven't received my order yet, but it was marked as shipped. What is going on? The post office will refund the cost of shipping if an item hasn't shown up after 45 days, but they will not refund the cost of the contents unless the buyer has purchased insurance for the order. I'm happy to pass on the refund by the post office if an order is lost, but can't reimburse buyers out of my own pocket for orders that are lost by the USPS.